I had a conversation with an SF author a few months back, who utterly despaired at the fact that everything’s already been done, that there are no new plots out there, and that being original is a thing of the past. I was so surprised that an SF author would say something like that, that I couldn’t find the words to explain how easy it is to do something original and new. Part of the beauty of reading science fiction or fantasy is that anything is possible and that something truly new and original could wait for us. That is also the beauty of writing science fiction and fantasy: you discover the new as you write it. In our conversation, I’m sad to say, I found all the wrong words and all the wrong explanations. I’m pretty sure I said that there are a million totally crazy ideas out there that have never been done. The problem with what I said is that sometimes a crazy idea just comes out as a crazy idea and not as a good story. There is a way to be original, new, and even crazy, and to write a good story while doing it. If you have a great idea for, say, a mystery story, a twist that’s never been done before, you’re already working within the reader’s known parameters. All you’re doing is supplying a new variation on an old theme. If you want to be truly original when thinking of a new story, shun everything that reeks of a genre you know. This doesn’t mean you have to invent a new genre. Inventing a new genre means working within a structure that is easy to copy. That limits the structures you can use. You can just create your story, one story, that fits perfectly into whatever you want to say. Working within genres kills originality. Once you get your head around that, new concepts, new plots, and new ideas start popping into your mind. This is a little trick I try to use in almost all my stories, and it works splendidly. It’s a concept borrowed from Mark Twain. Mark Twain would occasionally want to write a story about something he knew would be too crazy for his readers to swallow. So he began his story by saying he met this strange person on a train or in his travels, and that person had a crazy story to tell. Then that person tells the story, and the readers swallow it whole. The story is Twain’s, he didn’t really hear it from anyone. But Twain knew that if he told a crazy story straight, it wouldn’t be believable. But hearing it from someone? That’s fine. So let’s change his idea a bit. We work in a field where anything is possible. But if we actually wrote anything and everything, most of it would be too crazy to swallow. Rather, find a plot which allows for the possibility that anything is possible within the story. I’ll say it again, because that was a tough one: To write a story in which anything is possible, write a story in which something happens that makes anything possible. I’ll give you three examples from my new book, ‘Secret Thoughts’. The book consists of three novellas that take place in the same world, and in each of the novellas, I used this trick. In the first novella, ‘The Perfect Girl’, I take a young telepath, near her twenties, and put her in a school for people like her. Apparently, the place is also like med-school: donated dead bodies come in. We find out that a dead mind can be read for a few days after it’s dead. It can’t think, but you can roam down any path that’s already been taken. The young telepath in the story delves into a dead woman’s mind. The dead woman is nearly her age. A bond is formed, and the telepath explores the dead woman’s past. Now, in exploring the dead woman’s mind, everything is possible. You see? Like a story within a story, this is an SF story (anything is possible) that has a premise that makes anything possible. I’ll give you another example. In the second novella, ‘The Linguist’, a telepath is called to read the mind of an alien. There is no other way to communicate with it. This is a last resort. We don’t know what will happen when this telepath touches the alien. Obviously, you can’t read an alien as you would a human; the wiring is completely different. And yet something does happen. I won’t spoil the story and tell you what happens and how, but I will say that I had to invent a completely new way for a telepath to ‘read’ an alien mind and to ‘see’ its thoughts. Again, I’ve created a premise which allows me to do anything. In the last novella, ‘Most Beautiful Intimacy’, I made a telepath pregnant. In this world, telepathy works by touch. A pregnant telepath can’t disconnect from her baby. Not only that, she can’t always be in control, and so she can’t always tell herself apart from the baby. The story follows the telepath’s exploration of her baby’s mind as it develops during nine months of pregnancy. We will witness the first glimpse of a thought, the first half-emotion, the first senses, the first subconscious thoughts, the first everything. Again, this is completely uncharted territory. I could do anything! So, you see, if you look for a premise that allows you to do anything, you can do anything. Not only will it be original, but it will also mellow the craziness of the ‘anything’ that you’re describing. There are two kinds of surprises you can pull on the readers as the story progresses. In the first, you get to a point in which something is supposed to happen (hopefully, every paragraph or so), and then one of the characters does something that surprises the readers. That’s the regular way of doing things. Let’s look at the other way. In the second, you get to a point in which something is supposed to happen (hopefully, every paragraph or so), but that point is constructed in such a way that the readers have no idea what happens next. Do you see the difference? In the first, you have an ordinary plot but surprising characters, and the reader tries to outguess you. In the second, you have a plot in which everything is possible that carries you from one unknown to another, regardless of the surprising (or ordinary) behavior of the characters. How do you create this paragraph after paragraph? Like anything else in writing, you practice. Try and write a plot in which, time after time, you truly have no idea what will happen next. If the plot carries you to a place that you think you may have seen before, start again. Do this again and again until your brain is used to creating a plot that carries you only from unknown to unknown. It’ll take time, but it’s not impossible. I hope you liked getting a glimpse of writers’ mind and his tricks. Achieving a truly original plot or a crazy plot that looks like an original story is not impossible. Trust me. Anything is possible. 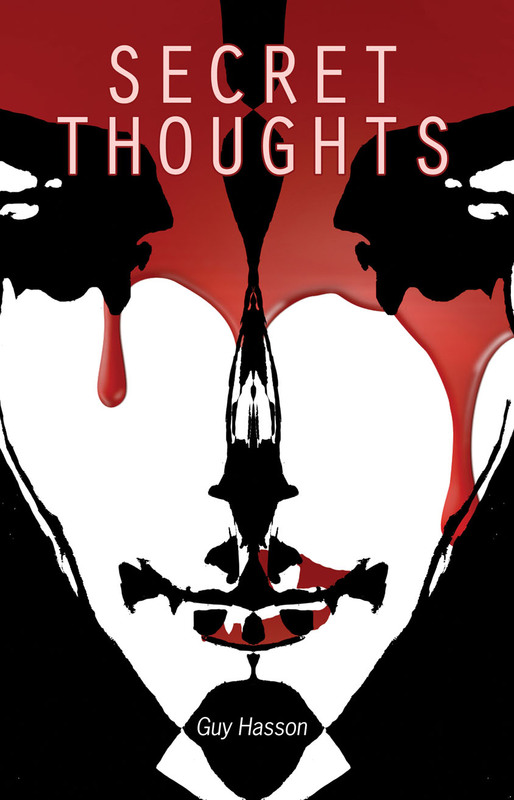 Guy Hasson's novel Secret Thoughts is now out from Apex Books. He can be found on his blog.Guy Hasson is an Israeli writer, playwright, and filmmaker. His fiction is predominantly written in English, whilst his stage and film work is written in Hebrew. He is also a two-time winner of the Israeli Geffen Award for science fiction short stories. Apex readers can find more of his work in the anthologies The Apex Book of World Science Fiction and Apexology: Horror. what a wonderful post, not to mention great timing! Guy, I just posted a review of your Secret Thoughts, and as I was reading, I was continually floored by how original your ideas were. Sure, we've all seen telepathic characters in SF movies or TV shows, but you put your telepaths in completely new and unique situations. scifi and fantasy are so wonderful because the boundaries are ever expanding. there's nothing that can't be done.